Organizing the files on my computer brings me a strange sense of calm. I have so many files related to my blog that things can easily get messy. After two years of blogging, I've found the file organization system that works best to keep me organized, focused and on schedule. I'm giving you a full view of how I divide and conquer the files on my Macbook. Even if you don't own an Apple device, this system can be easily replicated. All you need is a plain old computer or some type of cloud storage program that you can use to move and access files (Google Drive, Dropbox and Microsoft OneDrive are great options, and they're also free). I’ve always felt like it’s most intuitive to keep my blogging files under the Documents tab. Even though not all my files are documents — actually, most of them aren’t — it seems more practical to keep things there, as opposed to on the desktop (cringe) or in the Pictures folder. The Documents folder basically acts as my command center for the most important files I have on my Mac. I like to keep my folder count to a minimum. It keeps things tidy, ensures everything has its own place, and it keeps me from hoarding files I don’t really need. I’m going to take you through each one and show you how I name and sort all the files I keep in them. My Blog Inspo folder is pretty self-explanatory. It’s basically a local version of one of my Pinterest boards. 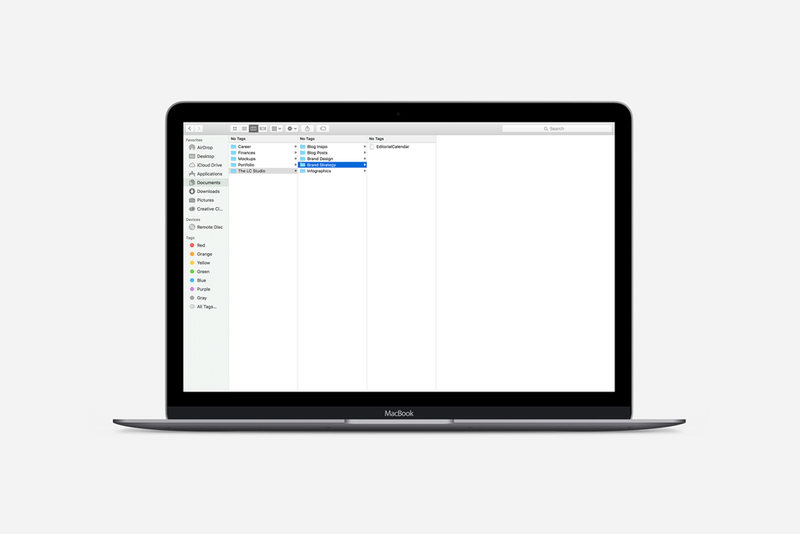 If I come across some blog inspiration that I know I want to implement in my brand, I’ll take a quick screenshot (Command + Shift + 4 on Mac) and save it to this folder so it’s handy when I’m writing or creating graphics. My favorite blog inspo items are related to web design, color palettes, infographics, logos and blog post ideas. My Blog Posts folder holds roughly 80% of my blog files. This is why it’s crucial to me that this folder is well-organized and well-maintained. It took me awhile to come up with a blog post organizing system that works for me, but I think I’ve finally got it down. First, I create a folder based on the name of each blog post. I say “based on” because I get really irked if my folder names are too long and have to auto-insert the ellipses (“…”) smack dab in the middle. So, I choose a few keywords from the post title that will allow me to differentiate it from other posts. For example, I have two different blog posts about desktop wallpapers: 4 Totally Zen (and Totally Free) Desktop Wallpapers and 7 Wallpapers to Perk Up Your Work Day. If I simply named one “Wallpapers,” I wouldn’t automatically know which blog post that folder is for. So instead, I shortened the first blog title to “4 Zen Wallpapers” and the second to “7 Wallpapers Perk Up.” Is it eloquent? No. Is it effective? Yes. I also like to include any numbers that are in the original blog post (like the 4 and 7 in the example titles) so that I know how often I’m writing listicles and which numbers are used the most. Granted, sometimes there a few too many keywords in my blog titles, or the words just happen to be long, and I just can’t avoid those silly ellipses. For example, my post titled Just Got Fired? 4 Affirmations to Tell Yourself Right Now was shortened to a folder titled Just Got Fired Affirmations. I don’t know how many posts I’ll end up writing about affirmations, or what to do after getting fired, so I kept the folder title as specific as possible so I can differentiate it from any future posts on the same topics. The ellipses are there… but that’s okay with me. I won’t lose sleep over it. Related: Physical vs. Digital Planner: Which is Best for Me? After naming my blog post folders, I then decide whether or not to add a colored label to them (Try it yourself with Apple's file tagging tutorial). I decide this based on the status of the post. If it’s in progress, I add a yellow label. If it’s already been published but needs to be updated — with a new graphic or an SEO-friendly title — then I add a gray label. If it’s totally done, then I leave it as is without a label. I like doing this not only because I’m a huge fan of color-coding but also because Mac OS allows you to sort files based on label color. I can separate my “in progress” posts from my “finished” posts from my “needs update” posts. This visual separation helps me focus on whatever post I’m currently working on, and I avoid forgetting about or losing things that need my attention. Once things are named and organized, I’m good to go! All the files related to that blog post are saved under its folder. That includes Adobe Illustrator files, Photoshop files, Apple Pages and Numbers files, JPEGs, PNGs and so on. I’ll change the folder’s label color when it’s done or if I decide it needs a little TLC to really blend with my brand identity. My Brand Design folder contains files that play an integral role in my brand identity. My logo, obviously, is one of those things, as is my favicon. I’ve got an Apple Pages document that lists all the specifics of my brand kit — fonts, hex colors, CSS code; things like that. Another thing I keep here is a set of Adobe Illustrator templates, which I use to design different title graphics to promote my posts on social media. These templates give me some creative freedom in my graphic design while also making sure I keep some consistency — which is the key to brand recognition, after all. My Brand Strategy folder is pretty desolate right now, since I’ve just recently been getting more strict about the strategic development and growth of my brand. Right now, this folder houses an Apple Numbers file (the equivalent of Microsoft Excel) named Editorial Calendar. I use this doc to chart out my past, present and future blog posts and brainstorm post ideas for the future. One of my goals for this quarter is to expand on what’s in my Brand Strategy folder. I’d like to integrate all the data from my Squarespace, Google, BoardBooster and SocialPilot accounts. I also want to come up with a competitive analysis of my brand compared to others who are in my same niche (Can you tell I majored in advertising?). Last but not least is my Infographics folder. This folder is a bit of an outlier compared to others in my LC Studio folder. Something really important that I’ve learned about branding is that you have to always be giving. If you’re reading this, you’re probably among the group of bloggers who doesn’t solely blog for fun. Of course we still love what we do, but we also want to develop our brands, expand our reach and maybe even make a profit along the way. And when we push out blog content, we’re hoping to get something back. A click, a follow, a mention. Something. It’s a form of giving, but it’s sort of a half-gift. It’s mutually beneficial. Now, when you create something simply for the sake of providing value to your readers, that’s giving. And infographics are often a prime example of that. I keep graphics in my Infographics folder that aren’t tied to a blog post. They stand alone and don’t require any extra action on the part of the reader. No strings attached content, I should say. Well y'all, that's about it! That's all the deets on the filing system I use on my Macbook. If you try it out, I'd love to know if it works for you! What do you do to keep your files organized? Share your thoughts in the comments or tweet me about this post!